So, three weeks after the blow-up at Mallory, the Cub is back together again, with a special racing piston in a nicely honed barrel so it should not need too much running in, and Thunderfest provides an opportunity for a few careful laps. The event starts with a few laps of practice, then there is a timed session of a few more laps, and after the times have been seen a speed is chosen by each rider. In the final session of 20 minutes + 2 laps the aim is to match the chosen average speed. Last year I set the time on the Cub, but got tempted to take the Daytona out for a blast in the final session so was third fastest but came third from last in what the event was actually about. 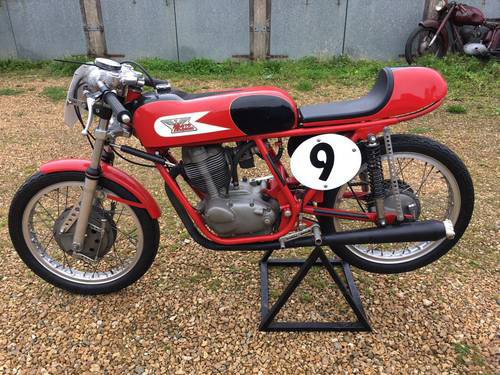 This time I was again using different bikes – the Cub for practice, the Morini to set the time, so that I could see if it was running better after the latest fettling, and the Daytona to use if the Morini was still not right. At least I have last year's times to look at so guessing the right speed should be rather easier. No action shots of the new Morini as it didn't do much, but here it is when Jenny first bought it. So, how would the Morini go? Fine in the wiggly bits and accelerating out of the bends, but it refused to run properly at high speed. Back to the Daytona for the final session then, I estimated the speed at 2 1/2 mph slower than last year, allowing for the Daytona maybe not being at its absolute best – and I could always back off a bit at the end. Of course, I didn't back off, so ended up 1.78 mph too fast, but 10th out of 27 is a great improvement on last year. Maybe I'll get it right next time!